Every living thing is unique in their own way. Look at your teacher, the trees outside, the animals in the zoo, and the insects on the ground. We look quite different, don’t we? Despite this, all of us have one thing in common. Can you guess what that is? A food chain shows how each living thing gets food, and how nutrients and energy are passed from one creature to another. So…why do we need to eat? Besides feeling bored or hungry, we eat food because we need energy to grow, move, and survive. This is true for all living things! FYI: Even plants need to eat! Plants “eat” sunlight to gain energy. Energy flows between living things when they eat or get eaten. Each animal is a link in a food chain. The above is a simple food chain where a barn owl is at the top. Let’s break it down! Producers — Plants are known as producers. This is because they produce their own food! For this particular food chain, the grass is the producer. Consumers — Animals are consumers because they can’t create their own food. Their food can be both animals or plants! The grasshopper, mouse, and owl are all consumers. 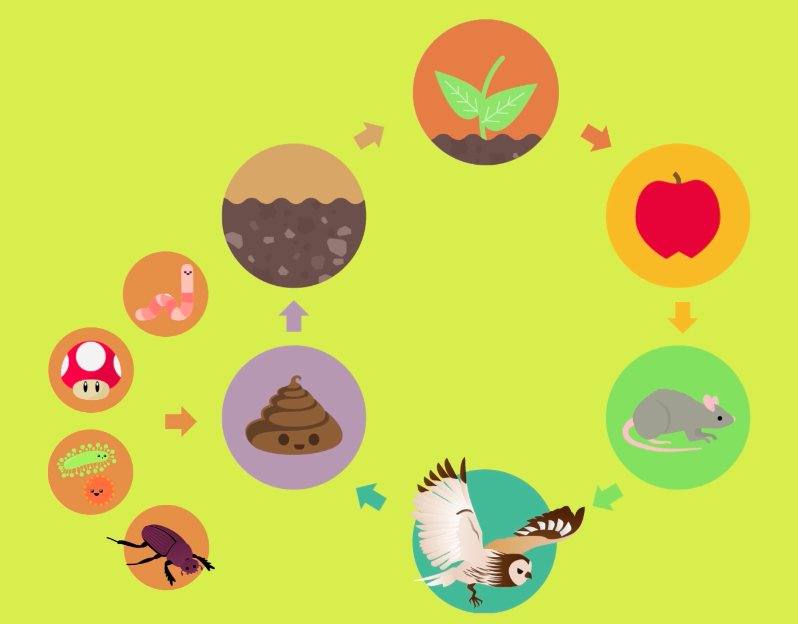 This is fantastic hands-on activity for your little ones to better understand food chains! It allows them to pick a habitat of their choice and come up with a food chain based on the residing animals. 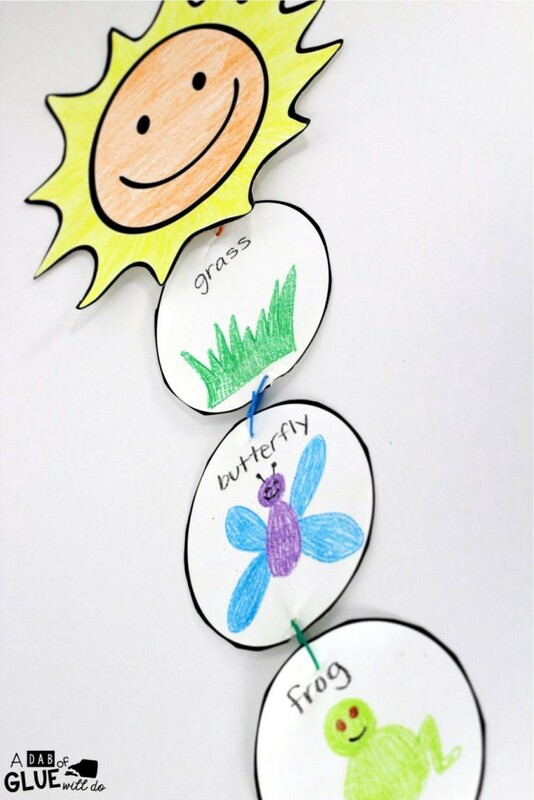 The mobiles can be hung up in rooms or classrooms where your children’s artwork can be appreciated by all! 1. Turn the cup upside down on a piece of paper and trace it to get a perfect circle! Repeat this 3 times (or however many organisms you have in your own food chain) and carefully cut them out. 2. In each circle, draw either a producer or a consumer. In the example above, they went with a food chain starting with grass, followed by a butterfly and a frog. 3. At the top of the circle above your artistic drawing, punch a hole and put a piece of string through it. 4. As for the sun, use the bowl to trace out the circle instead of a cup so that it’s slightly larger. Give your sun any facial expression you want! My favourite way to draw a sun is to have it wear a pair of sunglasses. 5. Tie the sun together with the chain of producers and consumers, and voila! All animals in an ecosystem don’t hunt for the same food every single day. For example, in human context, I might have pasta today and salad tomorrow! Similarly, in the animal kingdom, an owl might catch a mouse one day and a grasshopper the next. Animals, like us, interact with various prey, so a food chain alone might not be enough to represent the complexity of our ecosystems! When an animal from one food chain interacts with an another from another, this starts to form a food web. A food web is a big, tangled system that includes every plant and animal in a habitat. 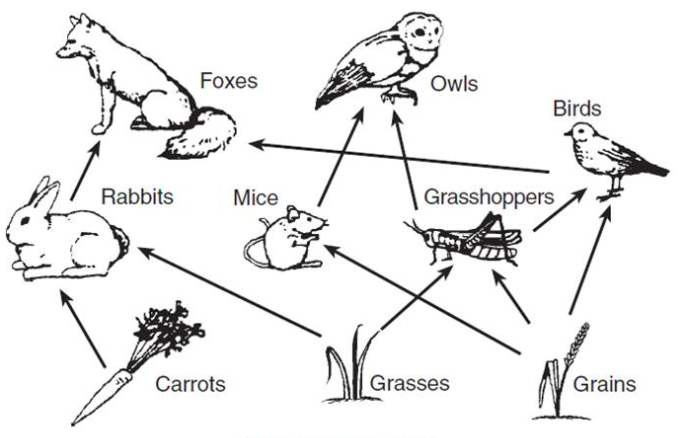 The food web below is one you’ll find on grassy plains! Bear in mind that all food chains begin with the sun! Plants (e.g. grasses and grains) “eat” by absorbing the sun’s rays and convert that into energy. When an animal (e.g. rabbit) stumbles upon a large field of grass, it’ll start nibbling to its heart’s content. When rabbits eat the grass, energy is transferred from the grass to the rabbit. If a hungry fox comes along and the rabbit isn’t careful enough, it will make a meal out of the rabbit! Energy is again transferred from the rabbit to the fox. Since no other animal is large enough to take on a fox, it sits at the top of the food web. All living things in an ecosystem depend on each other to thrive. If just one species within an ecosystem suddenly goes extinct, it can have grave consequences for the rest of the food web! Similar to how touching one part of a spider web causes the whole thing to vibrate, a change to any of the populations in a food web will affect the whole ecosystem!